Last year, I was in Hong Kong for three months. It was a fantastic experience and I would recommend it to anyone. I was there between August and October. The weather was way too hot for a English person used to being wet and cold but the sites are amazing there. My favourite two sites was the Peak at night, which was beautiful seeing tall tall buildings lit up at night and the Star Ferry at night going between Kowloon and Hong Kong. A photograph doesn’t do it justice how beautiful it is so I want put one up. Well I may put one up. It really depends on whether there is a photograph beneath this or not. As well as the amazing beautiful sites the food is pretty good. I mean awesome. Chinese food is lovely and I tried new things and some classics that you can find in the West. However, there are differences between Western Chinese food and traditional Chinese food, the main being that Chinese food has lots and lots of bones and they like the food to resemble the animal. For example, when i was in Macau I had a pigeon which came with its head on which was an interesting sight as you can see below. Another interesting food treat was chicken feet. Whist in Hong Kong, I was inspired to cook Asian food there. I cooked various Chinese dishes that already appear on FADHoppers however, there are a couple of lovely dishes I cooked which I haven’t put up on the site yet. So here they are. 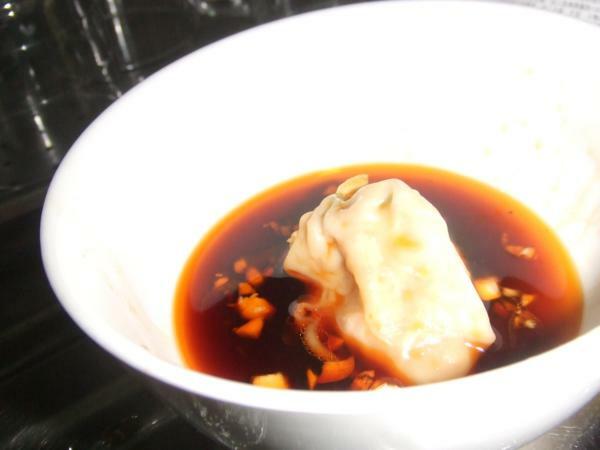 The first is a Wonton in Chilli Oil. I never had Dim Sum before Hong Kong and I wasn’t a massive fan of Wontons but then I had them in this amazing chili oil. I instantly became hooked and wanted to try it again and again. If you can’t buy wonton wrappers, use filo pastry. Also I think the dipping sauce would be awesome for other Dim Sum or anything you could think that would work with it. Wrap filling in wontons (for help with this please visit http://www.youtube.com/watch?v=De8oiSbG6qE). Heat a big pan of water until it’s boiling. Drop a few wontons at a time and cook for 3-4 minutes until the filling is cooked (wontons will surface and float on top of the boiling water). Remove and set aside to keep warm. Repeat until all wontons are cooked. Mix the dipping sauce ingredients together. Pour some dipping sauce into a bowl.